In Fifth Grade, the child begins to experience a healthy balance between early childhood and approaching adolescence. It is appropriate, therefore, that the curriculum this year encourages a theme of balance. Study of ancient history begins in India, continuing with the civilizations of Persia and the great cultures of Mesopotamia. A field trip to the Egyptian Museum studying the pyramids and pharaohs precedes the civilization of the Greeks, during which students participate in a classic Greek pentathlon with activities of running, long jump, wrestling, javelin, and discus. 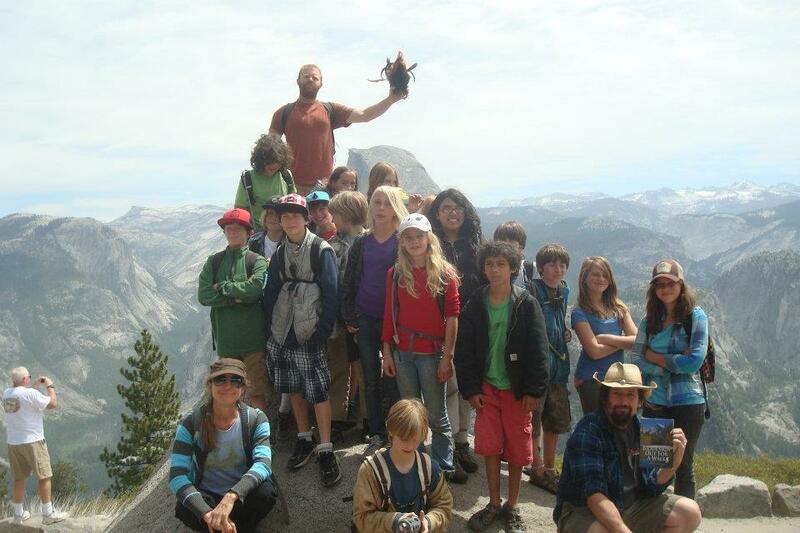 As a continuation of their study of the living earth, Natural Science is approached this year through Botany and Geography with a year end field trip to Yosemite National Park, enhancing the child’s understanding of local geography and plant life. Building on their years of form drawing, free-hand geometry is introduced. Higher work with fractions, ratio, and proportion are studied. Decimal exercises are practices in preparation for business math, which they will study more extensively in Sixth Grade. Fifth grade is referred to as the “golden year” because students at this age are enthusiastic about learning, eager for new challenges, and prepared to work hard. Their sense of self-consciousness emerges, yet they remain confident and in harmony with their surroundings. Students develop an ordered sense of space and time, and they gain a deeper understanding of personal responsibility and ethical principles. Fifth graders explore the history of human struggle and accomplishment in the ancient world. These histories present the diversity of experience in the early civilizations of India, Persia, Mesopotamia, Egypt, and Greece. Students investigate mythologies, and religions of these cultures, and they discuss philosophies of creation, life, and death. Working with early forms of writing, geometry, and architecture, fifth graders trace the roots of modern culture. Through these classical stories, students develop inner imagination and empathy with an ancient world that is different from their own. In fifth grade, students also peruse the biography of Alexander the Great--a compelling story of a human leader engaged in an epic quest of self-determination--which marks an important learning transition from mythology to history. Alexander’s story introduces students to the world of human leaders, historical campaigns, and real world events. Through their study of ancient Greece, students develop an appreciation for the balance between skill and beauty, art and science, earthly life and spirituality. In mathematics, decimal notation used in the four operations is introduced while students continue with fractions, multi-digit problem solving, and word problems. They also learn freehand geometry to gain a sense of the structure of space and delineated form. Studying botany nurtures the fifth graders’ dawning apprehension of beauty in the world, as they balance scientific observation with aesthetic appreciation. In studying North American geography, students examine how and why people live and work in specific regions. Students select one of the 50 states to profile in a research paper and a verbal presentation on the state’s history. They discuss how soil, landscape, and location influence culture. Their exploration of Native American history includes the people’s practical, cultural, and spiritual relationship to the land. In weekly gym class, students practice the five events of a Greek pentathlon: discus and javelin throw, wrestling, long jump, and foot race. In the spring, the class participates in an all day pentathlon festival and competition with other regional Waldorf schools. This is the culmination of the students’ physical individualism before they enter--in sixth grade--the new dynamics of team-based sports.